Happy Wednesday! It is Wednesday, right? Labor Day has made me all discombobulated. I’m super excited to share this easy recipe for Rosemary Dipping Sauce. We are a family of dippers. Rarely a meal takes place at our house without organic ketchup, hot sauce, homemade ranch dressing, homemade salsa or hummus. 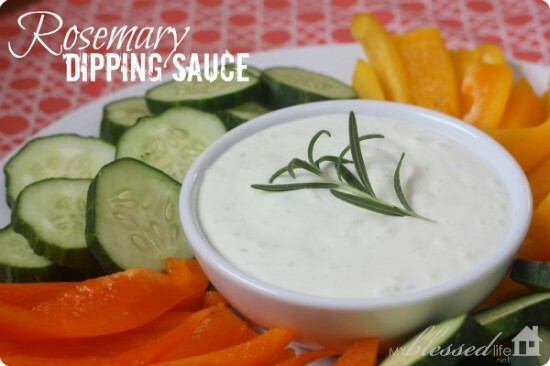 I recently whipped up this Rosemary Dipping Sauce to serve with vegetables and I have since made it to serve with my Parmesan Potato Wedges. It is so easy and delicious! Combine all ingredients in a blender and pulse. Chill and serve! Does your family enjoy dips and sauces? I’m totally a “dipper” too 🙂 Love dips! Kelly´s last blog post ..Catch Up. Looks like a great dip. Perfect for tailgating or football watching. Ohhhh I bet that is delicious! i love rosemary anything! sounds amazing. Make light with Greek yogurt and light mayo, with the onion and garlic you won’t taste the difference.